Buy MCX Gold between 23,500 – 24,000, SL below monthly closing basis – 20,000, Target – 30,500 / 31,500. MCX Gold Sell MCX Gold between 31,500 – 32,500, SL above monthly closing basis - 39,000, Target - 25,000 / 24,000. NCDEX Gold Hedge Sell NCDEX Gold Hedge between 26,500 – 27,000, SL above monthly closing basis - 30,000, Target - 23,600 / 23,000. Buy NCDEX Gold Hedge between 22,500 – 23,000, SL below monthly closing basis – 19,500, Target – 27,000 / 28,000. Gold is one asset whose prices can never go down, however if one needs to believe this, a reality check is definitely needed. Many of us buy gold with an emotional touch. And why not, the glitter which it presents and the feeling of content it gives are truly worth it. This emotional aspect draws many of us towards purchasing gold in a physical form. But, have you wondered if buying gold in a physical form is indeed the smart way for you. On the occasion of Akshaya Tritiya, let us assess how has gold performed this year in comparison to last so many years and what can be in store for this year. True, gold provides a hiding place whenever there is a lack of faith in the global economy or when there is a Geo-political tension that can impact gold prices. However, can gold benefit as a part of portfolio after such a massive fall last year is something that needs to be pondered about. After a 12 year rally, gold prices ended its bull run in 2013, wherein gold prices lost around 28 percent of its value. Bearish investors have been cheering gold's retreat. The popularity of placing bets on lower gold prices has grown throughout the year. The year 2014 seem to be a good year for gold, as prices once again started its bull run and headed towards $1400 mark making an impressive rally of 14 percent by mid March 2014 and then started declining and headed towards $1300 mark. Prices gained by more than 7 percent in the first four months of 2014 appealing gold as an asset class. In the domestic markets, gold prices gained by around 1.2 percent on year till date basis and gained marginally by around half a percent in Q1 of 2013. Gold prices rallied by around 14 percent by mid March this year due to Russia's military intervention in Ukraine that prompted safe-haven buying and investors ditched assets perceived as riskier such as equities. As a result of the escalation of this conflict and the damages it's going to do to the European economy, investors continued to rotate out of the stock market into the gold market and vice versa. Precious metal also found support from strong physical demand from China as Chinese net imports from Hong Kong totaled 112.3 tonnes in February and nearly twice the import in the same month last year. The reason for more imports being Chinese government granting more bank license to import gold in order to meet high demand. On the other hand, the recent decline in the gold prices from the (1390 mark) was a result of a series of factors; the most important being signs of recovery in the US, the world’s largest economy which has given more room for the FED to scale its monetary program-me and raised hopes of interest rate hikes in mid 2015. Recent economic data releases from US shows possible signs of growth. The US economy expanded more rapidly (at the rate of 2.6%) in the final three months of 2013 than estimated as consumer spending jumped by the most in three years, while initial jobless claims have been declining throughout last 4 months, curbing demand for the precious metal as a store of value. Consumer spending which is regarded as a key economic indicator that typically accounts for almost 70% of the US economic growth, rose 3.3 percent in the fourth quarter, the most since the final three months of 2010. On the inventory front, Gold stocks sitting inside U.S. exchange warehouses have risen to a 10-month high as physical buying has continued to weaken, underscoring concerns about slowing demand from Asia. Also, in the retail gold market, buying sentiment among private bullion investors edged down in March. The Gold Investor Index, which measures the balance of customers adding to gold holdings over those reducing them, was down to 53 in March from 53.5 in February. A reading of 50 signals an equal number of net gold buyers and sellers. Further the reading for April is also expected to decline compared to march indicating declining interest in the yellow metal. Besides, the physical demand from China is weak as net gold flows into China from Hong Kong fell to 85.128 tonnes in March 2014 from 112.314 tonnes in February. Weaker Yuan and domestic prices below the global benchmark kept banks on the sidelines from importing. Banks are reluctant to bring more gold into the country at a time when demand is soft and a weak yuan would force them to take losses on any sales. A few importing banks are also sitting on some stock that they had imported when the yuan was stronger and which they are now holding on to due to the cheaper domestic rates. Prices on the Shanghai Gold Exchange, the platform for all physical gold trades in China, flipped to a discount to spot prices in early March and remained lower than London prices for all of that month. In the last few days, they have been trading either on par or at a very slight premium. This indicates that slowing demand from China the world’s largest consumer of the yellow metal. The investment demand continues to be weak as liquidation continues in the Gold ETFs. SPDR Gold Trust, the world’s biggest gold trading platform has seen that gold holdings stood 792 tonnes as on 25th April 2014 which is at the lowest level in last four years and has declined by around 1 percent on a year till date basis, while for the year 2013, it had decreased by 41percent and ended at 798.22 tonnes as on 31st December 2013. In the immediate-term, support to gold prices will be seen especially as prices in the Indian markets could stabilize before taking a correction further. This is due to the wedding season and the traditional Akshaya Tritiya demand, during which investors and retail consumers in India prefer to make gold purchases (irrespective of the price) due to the auspicious sentiment attached to it. However a note of caution as gold has lost it’s seen over the past year on account of waning interest by the ETF investors and investors across the globe are generally in a sell mode. Over the medium term, gold is expected to witness a fall on the basis of declining status of gold as a safe-haven. In the current context, focus is shifting towards an improving US economy, a strengthening Dollar Index and expectations that macroeconomic conditions in the coming months would be better as the economy grows. In a scenario where expectations are positive, investors are most likely to go in for high-risk investments, rather than looking at a safe-haven asset. The overall mood in the market is to dump the yellow metal. From Akshaya Tritiya last year, on May 13 till date, gold prices on the MCX is up 7.06 percent (mostly due to weak rupee), while the international markets have declined by around 10 percent in the same time frame as investors have been on a selling mode globally and tough restrictions on import and jewellery businesses have taken the wind out of the sails of the sector. This will continue for this year also as investor’s appetite towards gold as a safe haven has drastically reduced and these will lead to gradual shift of funds from gold to other asset classes like equities exerting downside pressure on gold prices. In the above monthly price chart of Gold we have clearly seen that prices are in bearish mode after making a high of 35,040 levels in August 2013. In year 2013 Gold prices had corrected around 7.90% and in year 2014 from Jan 2014 to till date price had moved only 0.40%. In year 2014 prices had made a low of 28,119 levels and a high of 30,737 levels. As per the monthly prices pattern it formed a “Lower top Lower bottom formation” and also breached the down trend line and currently trading below it. If we look at the volumes, it’s in a declining mode from the year Aug 2011 to till date, which is not supportive for the prices. Technically speaking prices are trading below its 5 and 20 month EMA (Exponential Moving Average) and sloping southwards, which is negative signal for the prices in coming months. 14 month RSI is also falling and current reading stands at 53, indicating there may be room for further downside. MACD is also in negative zone which is also negative for prices. We expect Gold price to find support in the range of 26,500 – 26,000 levels, Trading consistently below 26,000 levels would lead towards the support at 24,000 ($1,050) levels and then finally towards the major support of 20,000 ($ 900) levels. Resistance is now observed in the range of 33,500 – 34,000 levels. Trading consistently above 34,000 ($ 1430) levels would lead towards the strong resistance at 39,000 - 39,500 ($ 1660) levels. Due to multiple factors indicating bearishness - we are recommending to sell Gold on rallies for a downside target of 26,000 levels. However, on a lower side around 24,000 levels appears to be strong support level and price should bounce from these levels. Hence one can initiate a long position at these levels. 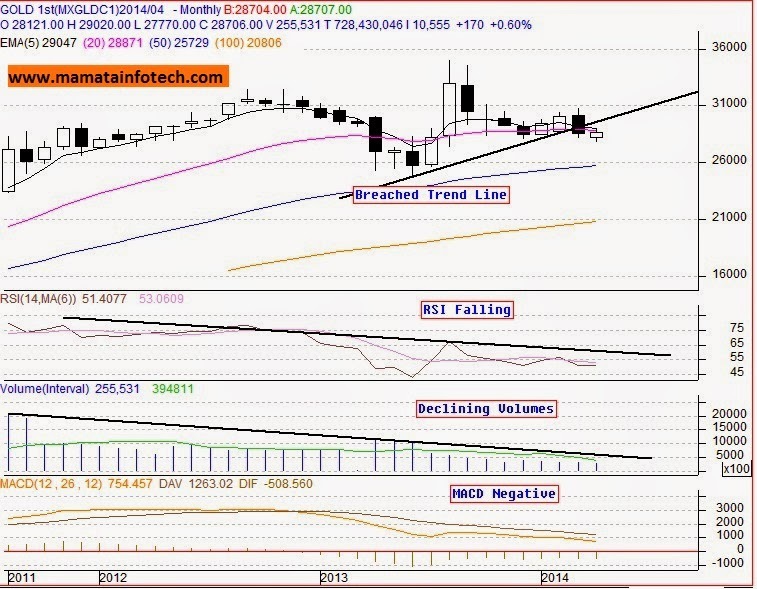 or Buy MCX Gold between 23,500 – 24,000, SL below monthly closing basis – 20,000, Target – 30,500 / 31,500. On the above daily NCDEX Gold Hedge price chart, we have seen that from the inception to till date NCDEX Gold Hedge price are trading in a sideways trend. NCDEX Gold hedge prices had opened the contract at 25,000 levels and in the same time it made a high of 27,200 levels. After making of high of 27,200 levels we have seen that prices are trading in a “Lower Top Lower Bottom formation” which is basically indicating pessimism. Gold Daily prices are trading below its 5, 20 and 50 Day EMA (Exponential Moving Average), indicating there may be room for more downside. On oscillator’s front, MACD is in negative zone and 14 Day RSI is also falling which also supports the bear trend. Prices have a strong support at 23,000 levels and below that at 19,500 levels. Resistance is seen at 30,000 levels. Due to multiple factors indicating bearishness - we are recommending to sell Gold on rallies for a downside target of 23600 levels. However, on a lower side around 23,000 levels appears to be strong support level and price should bounce from these levels. Hence one can initiate a long position at these levels. or Buy NCDEX Gold Hedge between 22,500 – 23,000, SL below monthly closing basis – 19,500, Target – 27,000 / 28,000.